In April 1904, B. H. Roberts mentioned that some debated whether “fifth Gospel” was an appropriate designation of 3 Nephi, demonstrating the idea originated at least a century earlier than President Hinckley’s use. Gospel literally means “good news,” and so in one sense 3 Nephi is a “gospel” because—along with Matthew, Mark, Luke, and John—it declares the good news of Christ’s Atonement and resurrection. As a literary genre, though, gospel is somewhat difficult to define. Broadly speaking, gospels are texts which focus on the life, teachings, and miracles of Jesus. Nibley’s work might suggest that 3 Nephi is a “gospel” within the meaning and tradition given to that genre by early Christians. Yet the designation as a fifth Gospel carries greater weight, suggesting it belongs within the same class as the four canonized Gospels, which, as New Testament scholar Christopher M. Tuckett observed, are quite different from the non-canonized gospels. Much like Matthew and Luke, 3 Nephi begins with the fulfillment of prophesied signs of the Savior’s birth (3 Nephi 1; cf. Matthew 1–2; Luke 1–2). Matthew, Mark, Luke, and John all mention John the Baptist, the forerunner sent to prepare the way for Christ in the Old World (Matthew 3; Mark 1; Luke 3; John 1). 3 Nephi likewise records the ministry of a forerunner who baptizes among the Nephites—the prophet Nephi, son of Nephi (3 Nephi 7:15–26). Matthew, Mark, and Luke all record the Father bearing witness of the Son, as does 3 Nephi (3 Nephi 11:7). Just as all four Gospels document the death and crucifixion of Jesus, 3 Nephi records the fulfillment of prophesied signs confirming the Savior’s death and three days in the tomb (3 Nephi 8–10). The 3 Nephi account may even help clarify the timeline of Christ’s entombment, since the account of the destruction adds information about the timing and duration Christ’s death. Just as the New Testament Gospels record the teachings of the Savior during His earthly ministry, 3 Nephi records the teachings of the resurrected Lord. This includes the Sermon at the Temple (3 Nephi 12–14), which parallels the Sermon on the Mount (Matthew 5–7) and Sermon on the Plain (Luke 6:17–49), the clarification of teachings recorded in John about His “other sheep,” and the institution of the sacrament. 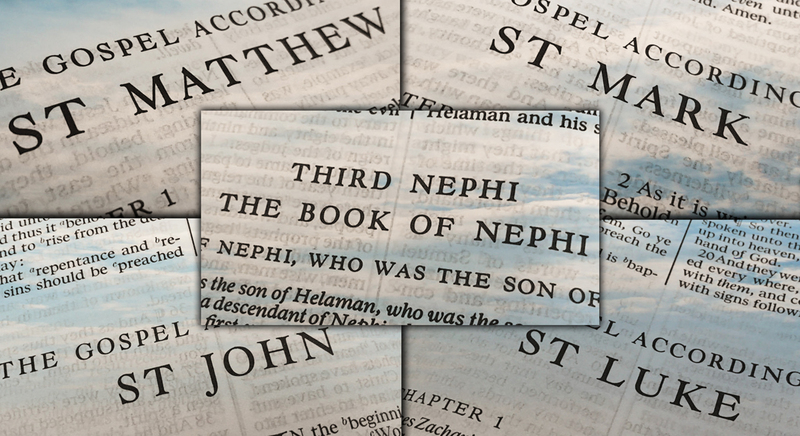 The Nephite record stands as a fifth witness of the bodily resurrection of Christ (3 Nephi 11), in a way that exceeds the all other Gospels, canonical and non-canonical. Several more points of comparison could be made. Yet just as the New Testament Gospels have key differences that ought to be noticed, 3 Nephi is different from the other four gospels in important respects. As LDS gospel scholar Andrew C. Skinner noted, the Savior “said and did things of which the four Gospels have no record, and for which 3 Nephi is our treasured source.” Key among these are the post-resurrection nature of the Savior’s ministry, and the emphasis on the temple in Christ’s teachings. President Ezra Taft Benson taught that the Book of Mormon, “is the keystone in our witness of Christ,” a point Elder Gary E. Stevenson reiterated recently. 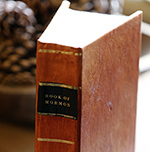 While the entire Book of Mormon is saturated with various testimonies of Christ, the Gospel of 3 Nephi is the preeminent reason that the Book of Mormon stands as a keystone witness of Christ’s divinity. Monte S. Nyman, Book of Mormon Commentary, 6 vols. (Orem, UT: Granite, 2003), volume 5. Hugh Nibley, The Prophetic Book of Mormon, The Collected Works Hugh Nibley, Volume 8 (Salt Lake City and Provo, UT: Deseret Book and FARMS, 1989), 407–434. President Gordon B. Hinckley, “Four Cornerstones of Faith,” Ensign, February 2004, online at lds.org. See also President Gordon B. Hinckley, “The Cornerstones of Our Faith,” Ensign, November 1984, online at lds.org. See B. H. Roberts, Conference Report, April 1904, 16. Gaye Strathern and Andrew C. Skinner, “Introduction,” in Third Nephi: An Incomparable Scripture (Salt Lake City and Provo, UT: Deseret Book and Neal A. Maxwell Institute for Religious Scholarship, 2012), viii: “All five Gospels testify that Jesus is the Christ, the Son of the living God. They are Gospels because they all declare the ‘good news’ that the atonement of Jesus Christ makes salvation available to all who come unto him with faith, repentance, baptism, the sanctifying power of the Holy Ghost, and by enduring to the end (3 Nephi 27:13–21).” Interestingly, according to Christopher M. Tuckett, “Within first-century Christianity, the term ‘gospel’ was used to refer to the Christian kerygma centering on in the death and resurrection of Jesus.” See Christorpher M. Tuckett, “Introduction to the Gospels,” in Eerdmans Commentary on the Bible, ed. James D. G. Dunn and John W. Rogerson (Grand Rapids, MI: Wm. B. Eerdmans, 2003), 989. In 3 Nephi 27:13–15, Jesus likewise defined gospel as centering on His death and resurrection, thus making the Book of Mormon usage authentic to the first-century AD. See also Andrew C. Skinner, “Jesus’s Gospel-Defining Discourse in 3 Nephi 27:13–21: Doctrinal Apex of His New World Visit,” in Incomparable Scripture, 281–307. See Tuckett, “Introduction to the Gospels,” 990–993. See also Christopher Tuckett, “Gospel, Gospels,” in Eerdmans Dictionary of the Bible, ed. David Noel Freedman (Grand Rapids, MI: Wm. B. Eerdmans, 2000), 522–524; Mark Allan Powell, “The Gospels,” in HarperCollins Bible Dictionary, revised and updated, ed. Mark Allan Powell (San Francisco, CA: HarperOne, 2011), 338–340. Tuckett, “Introduction to the Gospels,” 989–990 mentions some of these. Literature on the post-resurrection ministry of Christ in the Old World is frequently considered to be a genre unto itself, called the 40-day literature, since Christ’s post-resurrection ministry was 40 days. See Hugh Nibley, Mormonism and Early Christianity, The Collected Works of Hugh Nibley, Volume 4 (Salt Lake City and Provo, UT: Deseret Book and FARMS, 1987), 10–44. A listing with information about each of these documents is available at fortydayministry.com. Hugh W. Nibley, “Two Shots in the Dark,” in Book of Mormon Authorship: New Light on Ancient Origins, ed. Noel B. Reynolds (Provo, UT: Religious Studies Center, Brigham Young University, 1982; reprinted by FARMS, 1996), 123; reprinted in Hugh Nibley, The Prophetic Book of Mormon, The Collected Works Hugh Nibley, Volume 8 (Salt Lake City and Provo, UT: Deseret Book and FARMS, 1989), 409. Andrew C. Skinner, Third Nephi: The Fifth Gospel (Springville, UT: Cedar Fort, 2012), 5–9. See also, Book of Mormon Central, “How was There a Night without Darkness? (3 Nephi 1:15),” KnoWhy 188 (September 15, 2016). See Book of Mormon Central, “How was Nephi, Son of Nephi, Similar to John the Baptist? (3 Nephi 7:23–24),” KnoWhy 196 (September 27, 2016). Krister Stendahl, “The Sermon on the Mount and Third Nephi,” in Reflections on Mormonism: Judaeo-Christian Parallels (Provo, UT: Religious Studies Center, Brigham Young University, 1978), 141. See Matthew 3:17; 17:5; Mark 1:11; 9:7; Luke 3:22; 9:35. Matthew 27; Mark 15; Luke 23; John 19. See Skinner, Fifth Gospel, 9–19; Book of Mormon Central, “What Caused the Darkness and Destruction in the 34th Year? (3 Nephi 8:20),” KnoWhy 197 (September 28, 2016). David B. Cummings, “Three Days and Three Nights: Reassessing Jesus’s Entombment,” Journal of Book of Mormon Studies 16, no. 1 (2007): 56–63, 86; Jeffrey R. Chadwick, “Dating the Death of Jesus,” BYU Studies Quarterly 54, no. 4 (2015): 135–191, esp. 183–188. Stendahl, “The Sermon on the Mount and Third Nephi,” 141. See Book of Mormon Central, “Why Did Jesus Deliver a Version of the Sermon on the Mount at the Temple in Bountiful? (3 Nephi 12:6),” KnoWhy 203 (October 6, 2016). See John 10:16; cf. 3 Nephi 15:17–24. See also Skinner, Fifth Gospel, 74–77; Book of Mormon Central, “Why Did Jesus Say That There Were ‘Other Sheep’ Who Would Hear His Voice? (3 Nephi 15:21; cf. John 10:16),” KnoWhy 207 (October 11, 2016). See 3 Nephi 18:1–10; 20:3–8; cf. Matthew 26:26–28; Mark 14:22–24; Luke 22:19–20. See Skinner, Fifth Gospel, 108–110; Book of Mormon Central, “Why Did the Savior Emphasize His Risen Body in the Nephite Sacrament? (3 Nephi 18:7),” KnoWhy 211 (October 18, 2016). See Matthew 28; Mark 16; Luke 24; John 20–21. See Skinner, Fifth Gospel, 21–27; Book of Mormon Central, “Why Did the Savior Emphasize His Risen Body in the Nephite Sacrament? (3 Nephi 18:7),” KnoWhy 211 (October 18, 2016). For the most detailed treatment of 3 Nephi as a gospel, see Skinner, Fifth Gospel. See also Monte S. Nyman, Book of Mormon Commentary, 6 vols. (Orem, UT: Granite, 2003), volume 5. See Skinner, Fifth Gospel, 37–47; John W. Welch, Illuminating the Sermon at the Temple and Sermon on the Mount (Provo, UT: FARMS, 1999). For a discussion of modern imitation gospels in comparison with 3 Nephi, see Richard Lloyd Anderson, “Imitation Gospels and Christ’s Book of Mormon Ministry,” in Apocryphal Writings and the Latter-day Saints, ed. C. Wilfred Griggs (Provo, UT: Religious Studies Center, Brigham Young University, 1986), 53–107. Skinner, Fifth Gospel, 3. In support of this, Skinner cited 3 Nephi 23:7–8. Brain K. Ashton, “The Doctrine of Christ,” Ensign, November 2016, online at lds.org. Elder’s Journal, July 1838, p. 44, online at josephsmithpapers.org, grammar standardized. Ezra Taft Benson, “The Book of Mormon: The Keystone of Our Religion,” Ensign, November 1986, 5. Michael R. Ash, Shaken Faith Syndrome: Strengthening One’s Testimony in the Face of Criticism and Doubt, 2nd edition (Redding, CA: FairMormon, 2013), 125.